This week OOMG members Roy He, Joe Zambon, and Jennifer Warrillow attended the 2018 SECOORA Meeting in Charleston, SC. 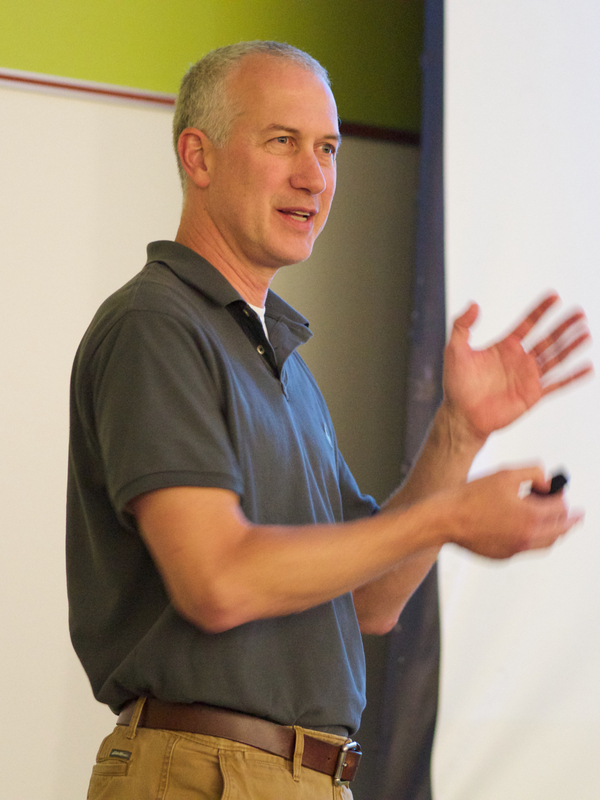 Tuesday, Roy presented a talk on CNAPS model development, advances in data assimilation, and improving model resolution. Roy was also presented with a gift as his tenure on the SECOORA board came to an end after 6 years. 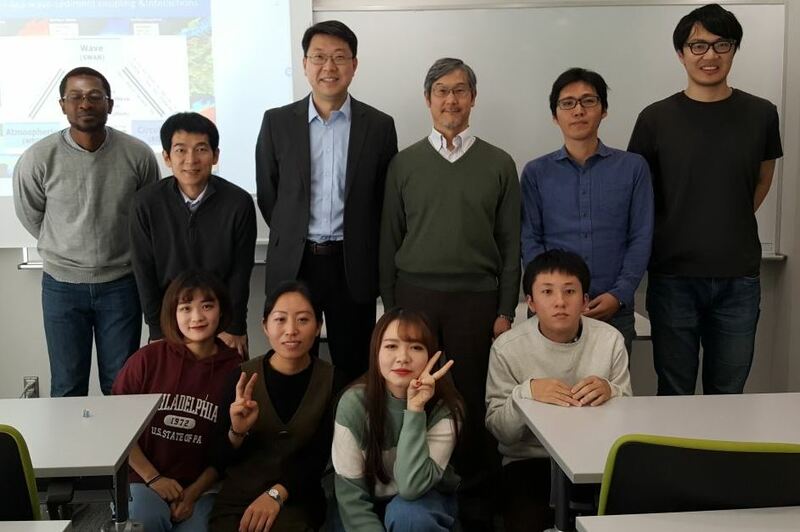 Wednesday, Joe gave a talk on his SECOORA project “Development of a 5-Year Daily, Cloud-Free Sea Surface Temperature (SST) and Chlorophyll-a Reconstruction Dataset Using the Data Interpolating Empirical Orthogonal Functions (DINEOF) Method”. 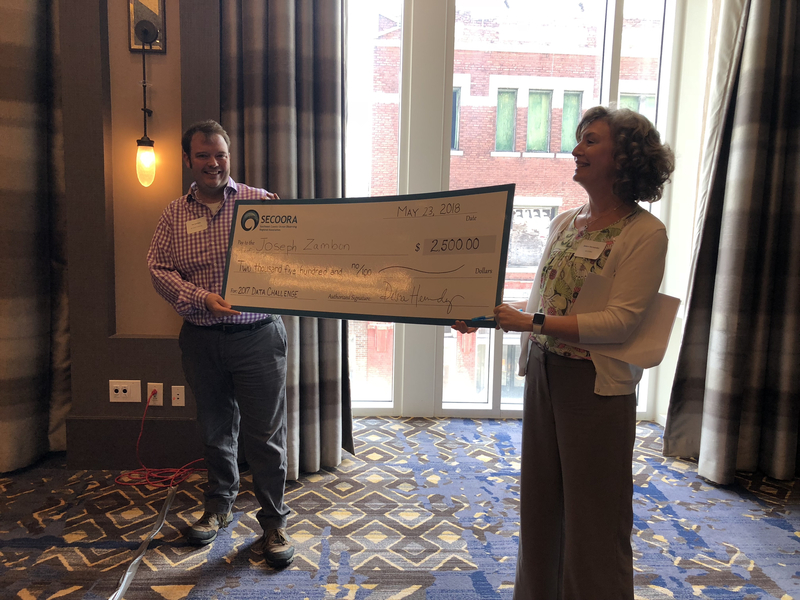 For this project, Joe won the SECOORA Data Challenge and was presented with a check from SECOORA Executive Director Debra Hernandez. Thanks SECOORA for a great meeting! Ocean Observatories Initiative Facility Board Town Hall. R. He. Marine Biogeochemical Responses to a Large Gulf Stream Offshore Meander. H. Zong, R. He, and X. Zeng. Investigation of Precipitation on Upper-Ocean Stratification During Hurricanes Irene (2011) and Harvey (2017). J. Zambon, R. He, J. C. Warner, and H. Zong. Marine Biogeochemical Responses to a Large Gulf Stream Offshore Meander. H. Zong. 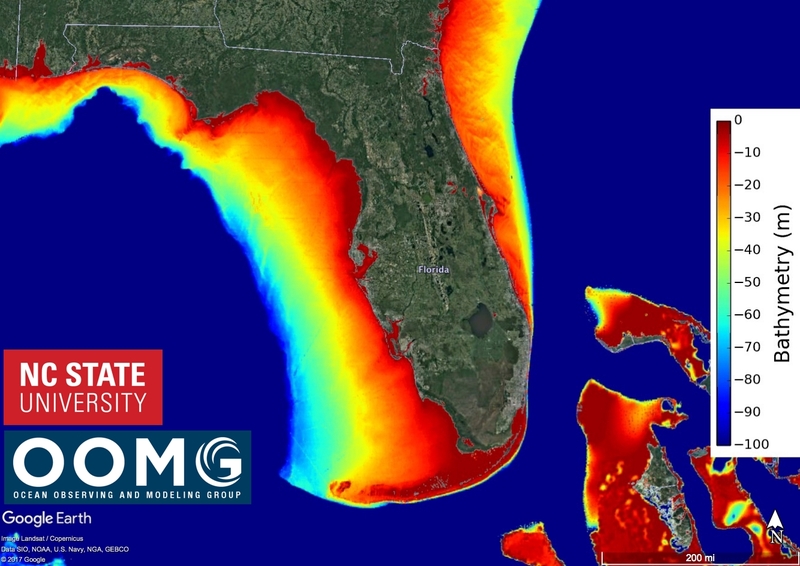 High Resolution Wave Modeling for Characterizing Wave Energy Resources Along the U.S East Coast. M. N. Allahdadi. Modeling Study of Physical-Biogeochemical Processes Associated With the “Green River” in the Gulf of Mexico. R. He and H. Zong. 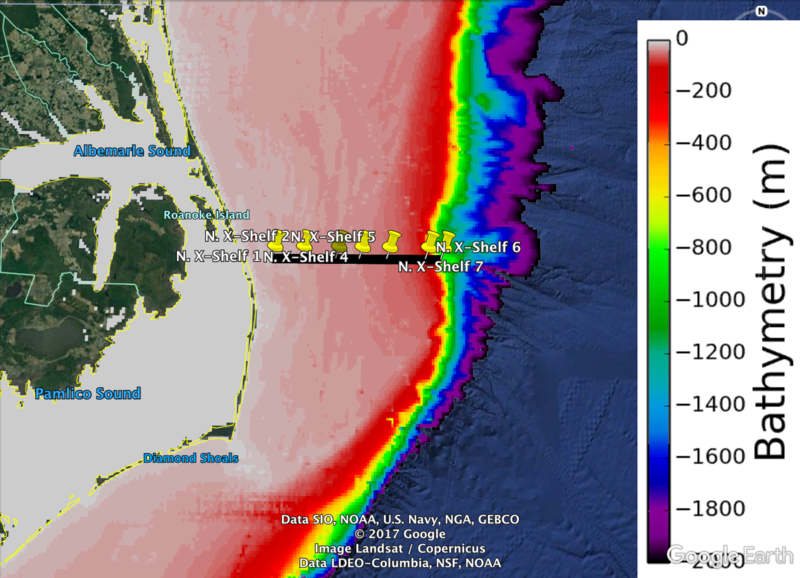 Modeling Processes Driving Exchanges Near Cape Hatteras, NC. X. Zeng, R. He, and J. Bane. Mesoscale and Submesoscale Mechanisms Behind Asymmetric Cooling and Hurricane-Induced Phytoplankton Blooms. L. McGee. Subantarctic Mode Water and Pycnocline Ventilation. B. Johnson. 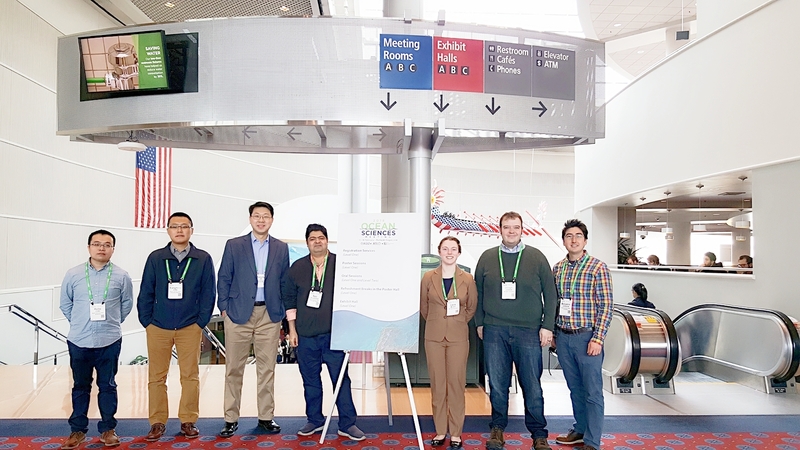 OOMG members at the Ocean Sciences conference, L to R: Haibo Song, Xiangming Zeng, Roy He, Nabi Allahdadi, Laura McGee, Joe Zambon, and Ben Johnson. After the successful recovery and refurbishment of several bottom profilers, moorings, and surface buoys, the first transect of the PEACH (Processes Driving Exchange at Cape Hatteras; NSF Award: 1559476) cruise was undertaken this evening and into the early morning hours. The transect spaced 7 stations along 60km of ocean from a few kilometers off of the NC Outer Banks to the continental shelf break. To collect sub-surface data, scientists utilized shipboard CTD, the workhorse of physical oceanographers. At each station, scientists and crew deployed the CTD package utilizing a winch that took it to within a few meters of the seafloor and then was pulled back onto the ship. The CTD takes several measurements per second that include ocean temperature, salinity, and depth. 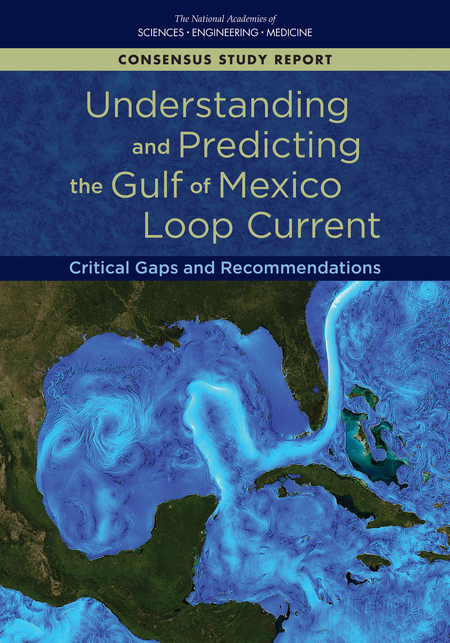 This allows oceanographers to understand gradients, such as density, that are essential to greater understanding of currents throughout the entire water column. In addition, each water type has a certain fingerprint of temperature and salinity, allowing researchers to determine where exactly a layer of water originated. A transect is formed when you deploy several CTDs over a line, allowing a complete representation of the ocean depth along a line. All of the CTDs were successful in collecting this data with the last CTD brought onboard at 2:30am. A pod of over two dozen curious dolphins were spotted circling the last CTD as it surfaced. After the CTD was secured, the R/V Neil Armstrong headed south, near Diamond Shoals. Tomorrow will feature more equipment servicing there during the day, followed by a another CTD transect across the Gulf Stream at night. Stay tuned to the OOMG blog for updates from Dr. Joe Zambon while he is at sea. 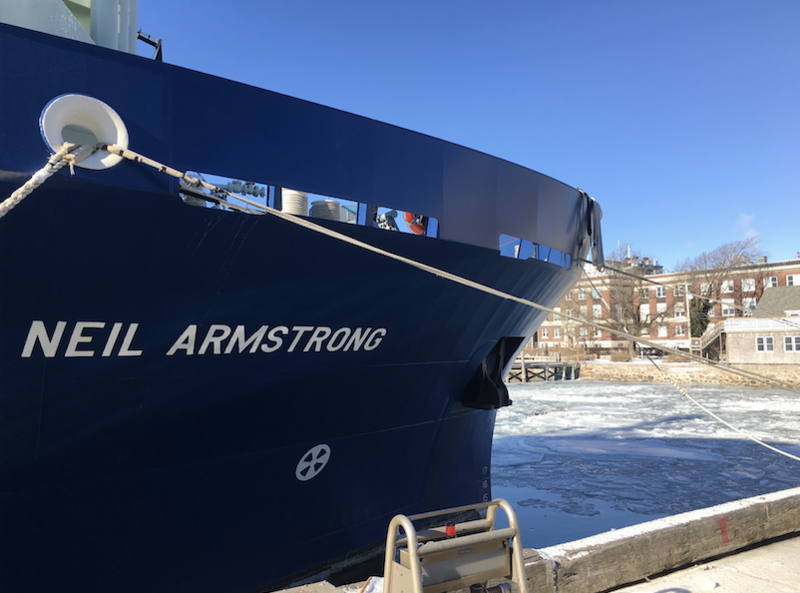 Also, track the R/V Neil Armstrong here. 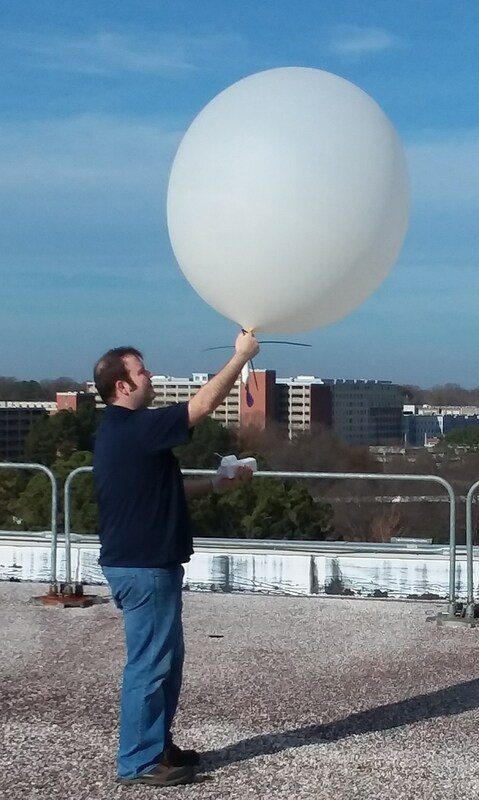 OOMG member Dr. Joe Zambon tested a balloon-carried radiosonde with the help of NCSU’s Dr. Matt Parker from the roof of Jordan Hall. After filling the large balloon with helium, Joe and Matt zip-tied it closed, then attached the unwinder. 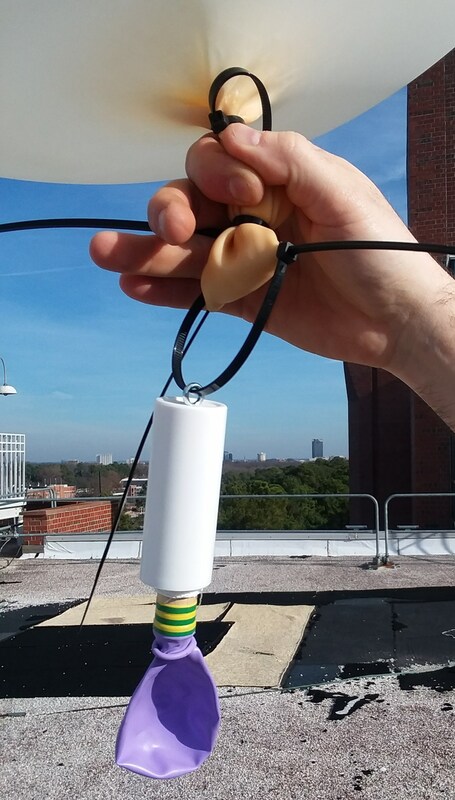 Between the balloon and the radiosonde, the unwinder gently spools out 10 m of string so that the radiosonde is far enough below the balloon to get a clear signal from GPS satellites. Radiosonde. Antenna at the lower right and instrument at the top. 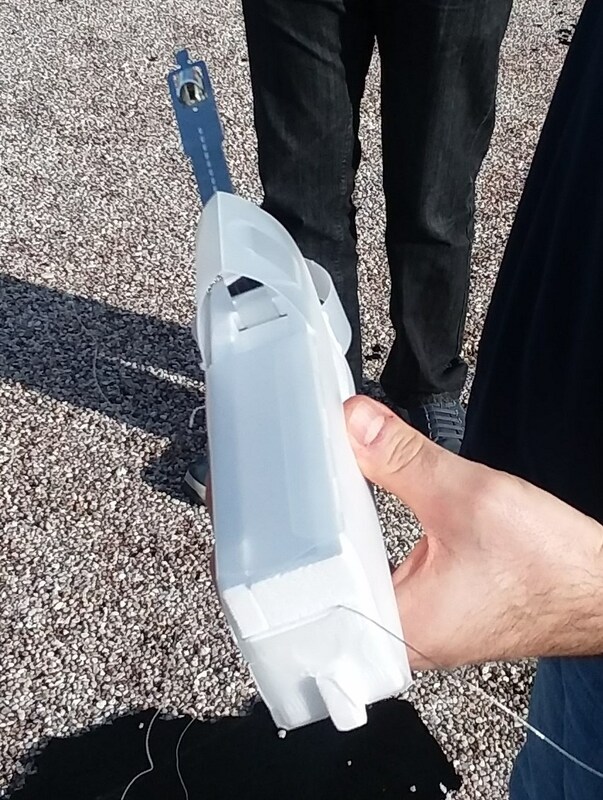 The lightweight radiosonde connects to the unwinder and bears an antenna for satellite and ground communication and an instrument that takes measurements as it travels through the atmosphere. 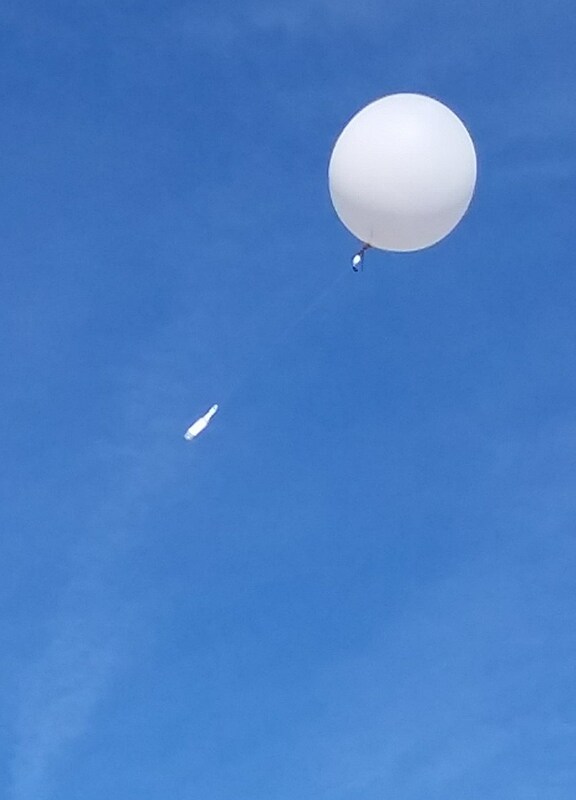 Balloon carrying radiosonde on its way! Joe will be launching a dozen radiosondes from the deck of the R/V Neil Armstrong during the January 2018 PEACH research cruise to collect data on the atmosphere while other instruments are collecting data on the ocean. Ocean-atmosphere interactions are critical to understanding ocean conditions. The radiosonde will record conditions such as humidity, temperature, and pressure as it rises. A small battery in the radiosonde enables it to transmit data back to the ground in real time. The balloon may carry the instrument through the troposphere (~ 17 km above the Earth’s surface), eventually bursting due to low atmospheric pressure. 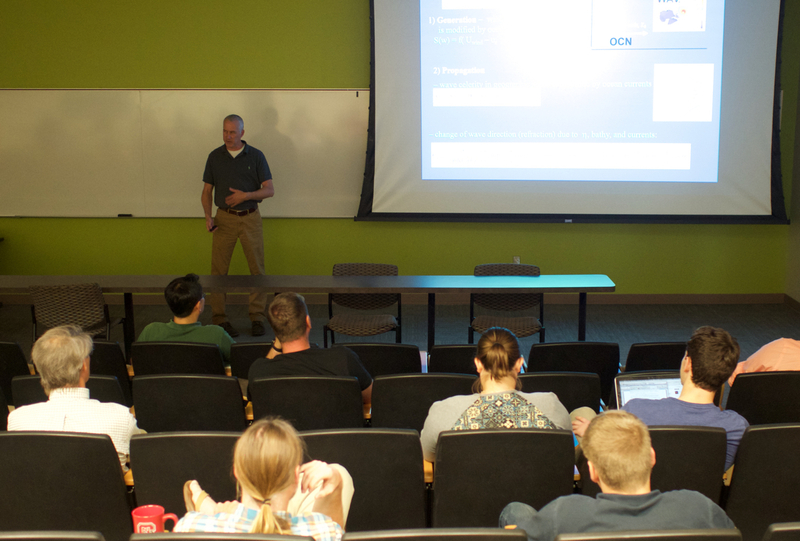 John Warner addresses the Department of Marine, Earth and Atmospheric Sciences at NC State. Dr. John Warner of the U. S. Geological Survey presented the Dept. of Marine, Earth, and Atmospheric Sciences seminar on 23 October, 2017. 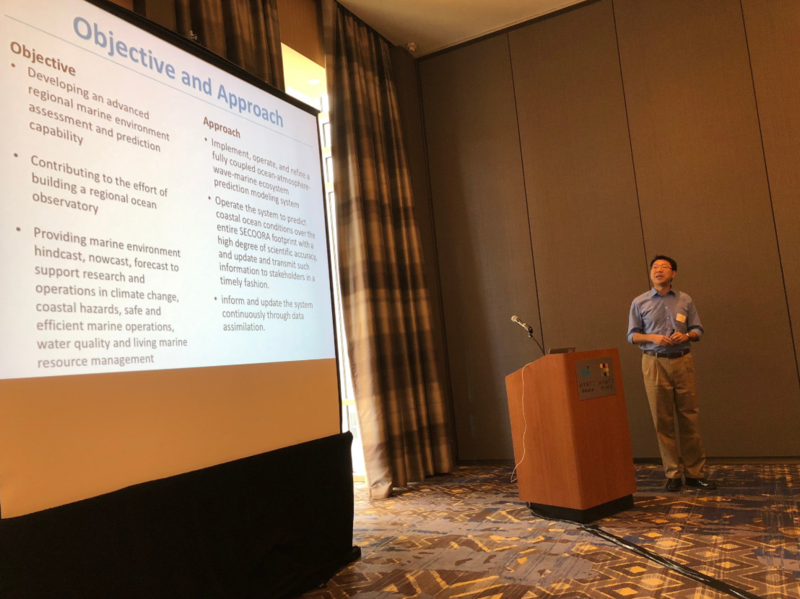 He spoke on Numerical Modeling of Geomorphic Changes During Hurricane Sandy, using the Coupled Ocean-Atmosphere-Wave-Sediment Transport (COAWST) numerical model. Dr. Roy He of OOMG hosted Dr. Warner. Dr. Warner discusses the component models comprising the COAWST framework. OOMG welcomes visiting student Yangyang Liu with NC State’s Howling Cow ice cream at Talley Student Union. OOMG welcomes its newest member, visiting graduate student Yangyang Liu. She comes to NC State from her home institution Xiamen University located in China’s Fujian Province. While at NC State she will be working on modeling solar radiation in the upper water column and its impact on the large scale ocean dynamics. 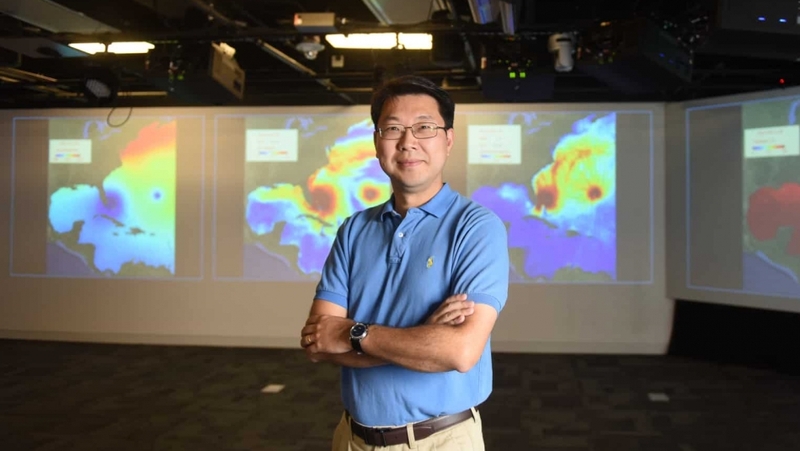 Her advisor, Zhongping Lee, is a graduate of the University of South Florida’s Marine Science program, along with OOMG Director Ruoying He. 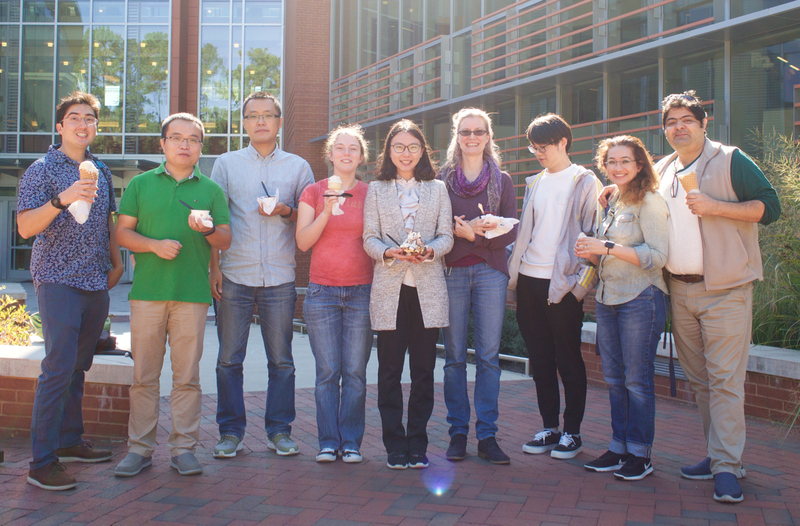 The group took Yangyang to sample NC State’s renowned Howling Cow ice cream at Talley Student Union. Howling Cow has been made at NC State for over fifty years and is a facet of campus life as well as a popular attraction the North Carolina State Fair. Our coupled models, initialized at 8pm on September 7th, have completed and are now able to resolve Irma making landfall in Florida sometime between 2am and 5am Sunday morning. As a result, both the 3 and 7 day runs are capable of resolving the storm and currently point the landfall as occurring between Miami and Homestead (where Andrew made landfall in August 1992). This is in agreement with last night’s National Hurricane Center (NHC) forecast. The forecast track has shifted back slightly west since then, but is still within the NHC track forecast cone. In addition to the 7-day animation shown, here is a KMZ file showing the predicted storm impact on southern Florida 54-hours into our forecast period (early Sunday morning). Included in the KMZ file are 10m wind + direction, sea level pressure (SLP) + wind direction, sea surface temperature (SST), significant wave height, estimated 1-hr precipitation, and simulated radar reflectivity for 06Z (2am EDT) Sunday morning. Load the files into Google Earth (available for free) to visualize the data. We will continue to update as the storm progresses.